Fifteen of the region’s top plein air painters will paint at Cedar Breaks, as well as other favorite southern Utah locations, from July 2 to July 6, 2017. The work each artist creates during that week will be on exhibit and for sale in SUMA beginning July 8, with a Wet Paint Gala and Sale on July 7. Pastel painter Arlene Braithwaite earned her Masters degree in art from the University of Utah. Her pastel paintings have been shown in solo exhibitions at the Springville Art Museum, St. George Art Museum, Utah Museum of Natural History and Zion National Park's Museum of Human History. 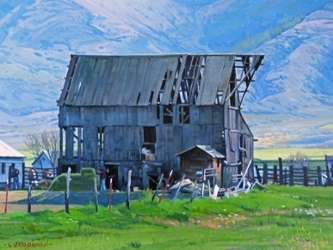 Braithwaite’s work has appeared in books and magazines, such as the Pastel Journal, International Artist and Artists of Utah. She has received additional recognition through first place and director's awards in statewide and regional exhibitions, including being selected twice as the Grand Prize winner at the Escalante Canyon Plein Air Art Festival. 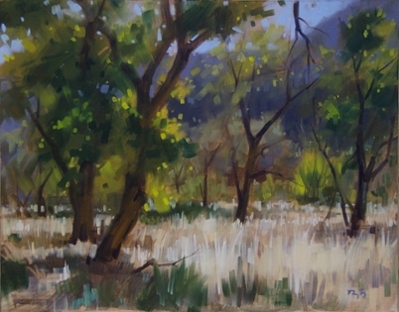 Braithwaite has also won the People’s Choice Award and several Purchase Awards at Zion National Park Plein Air Invitational. 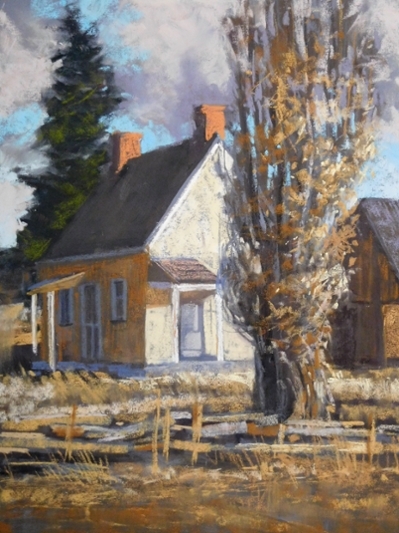 An exhibition of her work, commissioned by the Dixie National Forest, was exhibited at Southern Utah University (SUU) and the Sears Gallery at Dixie State College. 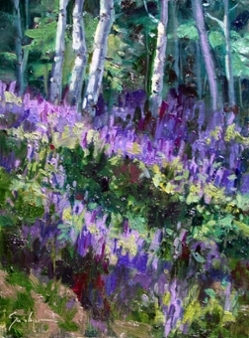 This past summer, she presented a solo exhibition at the Randall L. Jones Theater at SUU and participated in the Cedar Breaks "Arts Afire" Plein Air Invitational Show and the Zion Plein Air event. To build artistic interest in painting on location, Braithwaite has taught workshops for the Utah Art Education Association, SUU and Snow Canyon State Park. Before committing to full-time painting, Braithwaite enjoyed a 32-year career as an art educator at SUU, where she was awarded the University's Distinguished Educator Award. Braithwaite was also recognized as Art Teacher of the Year for the State of Utah by the National Art Education Association. For more information, visit Arlene Braithwaite's website. Utah Plein Air Artist Doug Braithwaite has been painting since he was old enough to hold a paintbrush. He pursued his love and talent of art and graduated from the University of Utah in 1991. Since that time, Braithwaite's bold brush strokes have been easily recognized by admirers and collectors. His work was once well-described in Southwest Art Magazine as “where realism meets abstraction,” almost like two paintings in one. From far away, it is almost photographic. However, as you move closer, you see much less detail and the bold brush strokes merely interpret what your eye sees. Braithwaite was recently featured on the cover of the November 2015 issue of PleinAir Magazine and was featured inside with a 5-page article written by Editor-in-Chief Stephen Doherty. He has participated in painting competitions across the country, receiving numerous awards including Best of Show in the Driggs Digs Plein Air Invitational in Driggs, ID; Everett Ruess Plein Air in Escalante, UT; Ogden Plein Air; Zion’s Plein Air Invitational at Zion’s National Park, Moab; Plein Air, Eccles Black & White Show; Wasatch Plein Air in Midway, UT; the River Rocks Plein Air in Idaho Falls, ID; Deseret News Color of the Land $5,000 Purchase Award; Mayor’s Award in Estes Park and an Inaugural Davis County Art Exhibit Award. For more information, visit Doug Braithwaite's website. Canadian born, but raised in Utah, Royden Card began his transformation into a painter when he was fourteen, with instruction from his father. His painting skills were refined at Brigham Young University (BYU), where he received a BFA and an MFA degree in painting. He went on to teach printmaking at BYU for 16 years. Inspiration for Card’s work comes primarily from desert landscapes and stems from family vacations to Utah's red rocks. Nature's raw, broken, eroded roughness speaks to him as an artist. He paints desert badlands, revealing their rugged beauty using intense color, odd perspectives and exaggerated, bold linear components, utilizing expansive vistas or close up fragments of landscape to create his paintings. His work has been collected by the Smithsonian, Utah Museum of Fine Art, Salt Lake City Airport, LDS Museum of History and Art, St. George Art Museum and BYU. Collectors have told him that living with his paintings has enriched their enjoyment of the desert; that they see more color, more detail and beauty when they return to the desert again. For more information, visit Royden Card's website. Michelle Condrat was born and raised in Salt Lake City, UT. She graduated from the University of Utah with a bachelor's degree in Painting and Drawing and a minor in Art History. 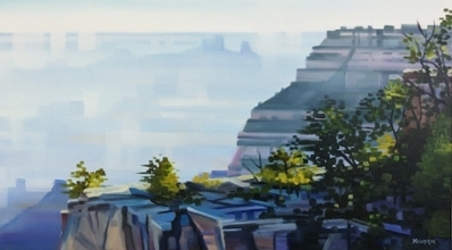 Condrat enjoys painting the unusual landscapes of Utah and the southwest. With intense color choices and broad blended strokes, she captures the unique look of the western landscape while creating a fresh visual perspective in her work. Not overly traditional, her paintings come with an edge because she tends to use specific and sharp brush strokes, which are being blended later into smooth vision. Condrat describes her work as contemporary impressionism, but also adores the cubism influence she’s under. Her signature moves are square surfaces that linger in light. Light is what she plays with the most because the lighting and shading can give more power to a landscape or portrait than any color in the world would do. She finds inspiration for her pieces in everyday scenery and the people that surrounded her, but she depicts them with a unique sun-kissed glow. Condrat adds a contemporary touch to her work by using more pixelated moves. With this approach, she is breaking out of the perfect, photorealistic image, so the viewer has to reimagine the whole sight. By adding sharp edges, she gives the paintings more life, more movement, and at the same time more soul. Condrat captures the wonderful richness of Utah’s nature with her camera and then uses photographs as a model in her studio. Being active in her art community is very important to Condrat. Besides painting in her studio, she teaches workshops and participates in Plein Air events, such as the Zion National Park Plein Air Art Invitational and the Grand Canyon Celebration of Art. For more information, visit Michelle Condrat's website. In Cody DeLong’s work, one notices a variety of subjects and painting styles. DeLong maintains that "experiments lead to insights," which is why he is always trying something new. It is what keeps his love alive for the process. He allows the subject to dictate his approach to a certain degree. His artistic journey began with airbrush illustration. DeLong had a custom airbrush facility in Las Vegas and painted hood murals and custom Harleys. When he tired of commercial art, he bought a small camper and spent 4 years traveling the country with his dog. It was during this journey that he began seriously painting in oils. 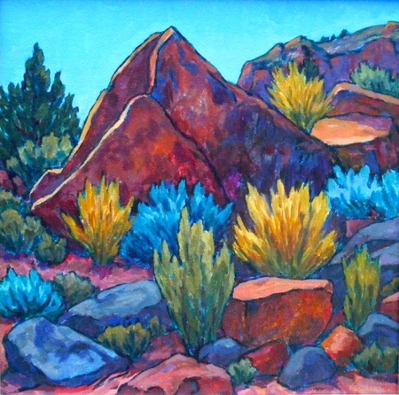 DeLong has been featured in many books, such as Sedona's Best Artists, Sedona Verde Valley Art, Plein Air Art New Mexico, Jack Richeson Series - Volume One and Richeson 75: Landscape and Exteriors (2007). His magazine publications include Western Art Collector, American Artist Workshop Magazine, Arizona Highways, Southwest Art, Sedona Monthly, Phoenix Magazine, the cover of Sedona Magazine in fall 2008 with a 3-page color feature and a feature article in Mountain Living Magazine. Most recently, DeLong had a 5-page feature article in the June/July 2015 edition of Plein Air Magazine. He has also participated in numerous plein air events. 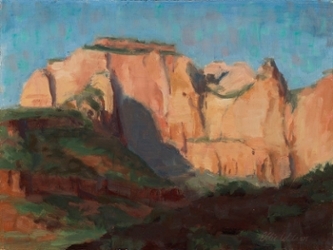 Currently, DeLong divides his time between his studio and gallery in Jerome, AZ, and plein air painting. He is a founding member and former vice-president of the Arizona Plein Air Painters and is a core member of the Jerome ArtWalk Association and Jerome Chamber of Commerce. He has been a cornerstone of the Jerome arts scene for nearly two decades. For more information, visit Cody DeLong's website. Denver artist Bruce Gomez has worked exclusively in pastels for the last 32 years. He has painted landscapes from Europe, Canada and the United States, with most of his subject matter coming from Telluride, the Grand Canyon, Sedona and Zion National Park. Gomez has participated in more shows than he can recall and his work has been featured in Plein Air Magazine, The Artist's Magazine, Art and Antiques, and in Southwest Art Magazine several times, where he was noted as an Artist to Watch Over $5,000. 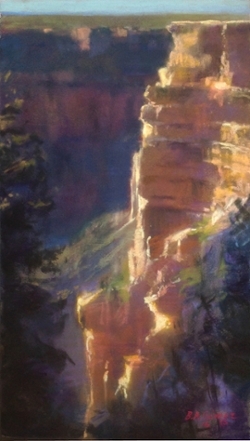 He has appeared in numerous Pastel Invitational shows, as well as Plein Air Invitationals including The Zion Plein Air Invitational (Collector’s Choice & Artist’s Choice Awards), The Grand Canyon Invitational and The Sedona Plein Air Festival (Collector’s Choice Award, Artist's Choice Award, and one of five Merit Awards in 2011 and 2012). For more information, visit Bruce Gomez's website. George W. Handrahan, a native of Utah, was raised in the rural community of South Weber. It was in this environment that he came to love and appreciate the diverse natural landscape surrounding him, taking every opportunity to spend time out of doors. As a student, Handrahan learned to appreciate many forms of art, but gravitated towards the work of LeConte Stewart, the American impressionists and artists of California, admiring their ability to portray the essence of light and form. Under the tutelage of Farrell R. Collett and Richard Van Wagoner, Handrahan earned his degree in art from Weber State in 1976. These influences led him to devote his skills full-time to landscape painting. The art of Handrahan is characterized by both his lifetime affinity with nature and his grasp of the thematic concerns of such artists as those previously mentioned. Today, his primary objective is to capture those instants in nature where form, color and light are constantly changing, while simultaneously instilling into each canvas a personal and emotional response. His paintings invite the viewer to see colors they might otherwise have missed, to sense a mood frequently ignored and to share in the beauty of a transient time and place. Handrahan’s work hangs in numerous private collections in Utah, California, New England and the southwest. He is represented in the permanent collections of the Church of Jesus Christ of Latter-Day Saints, the Springville Museum of Art and the State of Utah Art Collection. For more information, visit George Handrahan's website. Brad Holt grew up in Cedar City, UT. He is a graduate of Cedar City High School and Southern Utah University. He spent childhood summers working on his grandfather's ranch in Orderville, UT, hauling hay and punching cows. Holt's desire to become an artist began with a childhood fascination with the images of the surrealists. He was mentored by the renowned southwestern landscape painter Jimmie Jones, who was a friend of his family. Jones gave him a lot of old paint and brushes, taught him how to stretch a canvas and showed him how to lay out his palette. Holt recalls, "Raw Umber and Ultramarine were the core of Jimmie's palette, and they remain the core of mine to this day. They allow a subtle interplay of temperature in the under painting." Holt is primarily a plein air landscape painter. He has received numerous awards and has participated in many Invitational events including, Grand Canyon, Zion, Cedar Breaks, Sedona and the Sears Dixie Invitational. He has also been on the faculty of the Plein Air Convention and Expo. 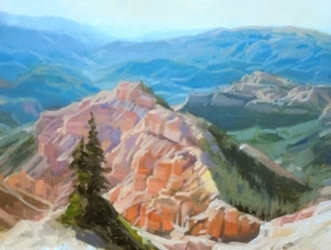 Holt took First Place in the Everett Ruess Plein Air competition in Escalante, Utah, in 2006. He twice received the Artist's Choice Award and was a Featured Artist in 2012 at the same competition. For more information, visit Brad Holt's website. Susie Hyer has been drawing and painting since she was a child. "I remember drawing a pair of ceramic flamingos my mother used to keep on her dining room table when I was four years old," she says. "I knew from that moment I would be an artist when I grew up." She attended art programs at Moravian College, The Baum School of Art and the University of West Florida and continues to expand her repertoire and abilities. Hyer has been working professionally since 1976 and has been the recipient of a number of scholarships, grants and awards, including two international design awards. She has been published in the Art of the National Parks: Historic Connections, Contemporary Interpretations and Landscapes of Colorado. She has been a featured artist in Southwest Art Magazine, Fine Art Connoisseur Magazine and Art of the West Magazine. Hyer maintains a home, studio and multiple gardens in Evergreen, CO, where she lives with her husband, sometimes one or two grown children, a dog, 2 cats and numerous elk, deer and other wildlife. She continues to push herself in new directions, traveling to paint en plein air and working from sketches, field studies and photos in the studio. For more information, visit Susie Hyer's website. Being creative has always been a part of Mary Jabens’ life. Different mediums, subjects, places, people and events continually shape and inspire her as an artist. Her passion is plein air painting. Living in Southern Utah provides a lifetime of subjects that are irresistible to her desire to paint. Jabens wants to relay to the viewer why she felt drawn to a particular scene by using the elements that make up nature. Warm and cool colors, light and dark values, soft and hard edges - all of these are needed to complete her painting. Jabens has participated in and been recognized at the Artists of the New Century show at the Bennington Center for the Arts, Zion Plein Air Art Invitational, Where in the World Plein Air, Escalante Plein Air Festival, Cedar Breaks Arts Afire Plein Air Festival and Faso Bold Brush Competition. She has also been featured in Outdoor Painter magazine. For more information, visit Mary Jabens' website. Roland Lee is a master watercolor landscape painter and signature member of the National Watercolor Society. He has been featured in magazines, such as The Artist's Magazine, Drawing Board, Art West and Western Art Collector. 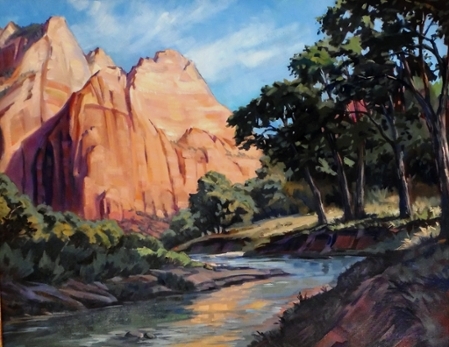 Although he travels and paints worldwide, his paintings of Zion National Park have become iconic. 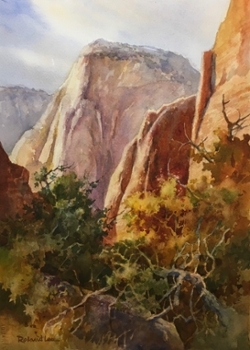 His paintings were selected for exhibit in Arts for the Parks Top 100 and Paint the Parks Top 100 shows and are featured in several books, including Art of the National Parks, A Century of Sanctuary: The Art of Zion National Park, Painters of Utah's Canyons and Deserts. 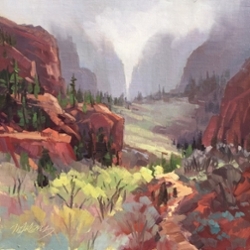 Lee has participated in several plein air events including Zion National Park Plein Air (Top Seller and People's Choice awards), Wasatch Plein Air and Thanksgiving Point (First Place Quick Draw). He received the Governor's Mansion Medal from Governor Gary Herbert in 2014 for 40 years of contribution to the arts in Utah. He has taught workshops throughout America and taught art full-time at Dixie State College in St. George, UT. His paintings are in over 1,500 museum, university, national park and private collections worldwide. For more information, visit Roland Lee's website. Valerie Orlemann is a realist landscape painter working with oil on canvas. She studied art at the University of Utah, completing most of the BFA program before parenthood, until a new job for her husband set her loose in southern Utah’s dramatic scenery. Valerie wound up far away from art school, but was surrounded by beautiful landscapes to paint. Orlemann’s work has been exhibited work in galleries in Salt Lake City, St. George, Provo, Dallas and Flagstaff, and at art festivals around Utah. Her work has been recognized with awards, including Best in Show at the 2016 Cedar Breaks Arts Afire Plein Air, first place in the 2016 Escalante Canyons Art Festival Public Lands paint out and purchase awards by the St. George Art Museum and Dixie State University. Orlemann has been the featured artist at the Cedar City Arts Festival and the Escalante Canyons Art Festival, and was selected to be an Artist in Residence at Mesa Verde National Park. She also received the Professional Artist Award at the 2012 Business of Art. 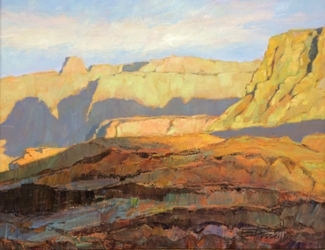 Her work is included in Painters of Utah’s Canyons and Deserts by Poulton and Swanson (Gibbs Smith Press, 2009). Her painting from the 2016 Arts Afire Plein Air Invitational is the signature piece for this year’s Chasing Light Plein Air Festival. She lives with her husband and daughter in Parowan, UT. For more information, visit Valerie Orlemann's website. Over 30 years of professional painting gives Rachel Pettit the experience to approach each new canvas with confidence. Manipulating the paint in different ways, using thick or thin paint, palette knife or brush, soft blended strokes or hard lines - all can effect the outcome of a painting and add excitement to the piece. Born in Wisconsin, she moved with her family to Scottsdale, AZ. Her training has included workshops and classes with regional and national masters. Her paintings have taken on an impressionistic style which captures the essence of the subject and conveys it to the viewer. Pettit’s paintings have been juried into many of the nation's top exhibitions, including Arts for the Parks Top 100, Oil Painters of America Exhibitions, Salon International and American Impressionist Society, along with a feature in International Artist Magazine. Her work is also included in collections throughout the United States. 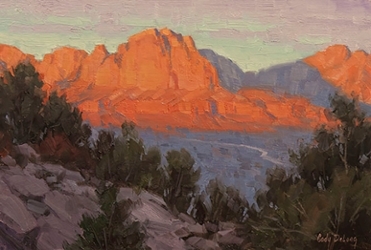 In 2016, Pettit’s work appeared in the Zion National Park Plein Air Invitational, Sedona Plein Air Festival, Paint the Peninsula Plein Air Invitational, Plein Air Magazine, Cedar Breaks Arts Afire Plein Air Invitational, Plein air Artists of Colorado National Exhibition and the American Impressionist Society National Juried Exhibition, to name a few. For more information, visit Rachel Pettit's website. Bonnie Posselli's quiet and meticulous rendering of trees, as well as her rich luscious hews depicting the many moods of Utah's redrock country, have won her critical praise coupled with an impressive group of collectors. She has been recognized with the One of One Hundred Best Artists of Utah Award, the 150 Year Survey presented by Springville Art museum and was a member of the 2002 Winter Olympics curatorial committee. She has participated in the Maynard Dixon Invitational from 1999 to 2016 where she earned the People's Choice Award in 2000 and 2010 and Best of Show 2001. Her work is featured in the book Paintings of Bonnie Posselli (Hardcover, 87 color plates, 120 pages). Posselli grew up in Salt Lake City, the eldest of six children. Family vacations included camping throughout the western states. She recalls her absorption with the beauty and wonder of nature, now reflected in her paintings. As a young adult, Posselli was encouraged by her mother, an artist, to join her in a plein air painting group. From there the die was cast. Her most significant influences are from early landscape painters, such as John F. Carlson, Richard Schmid, Edgar Payne and LeConte Stewart. For more information, visit Bonnie Posselli's website. Although Ellie Wilson is a recent graduate of Brigham Young University and has only been painting professionally for a short time, she has already built an impressive resume. Her work is featured in galleries in Park City, Sundance and in Plein Air Magazine. She has participated in the Escalante Plein Air Competition where she won an award. Wilson began landscape painting when one of her professors invited her and other students to go plein air painting. Standing in the open air with the mountains surrounding her and a brush in her hand just felt right. 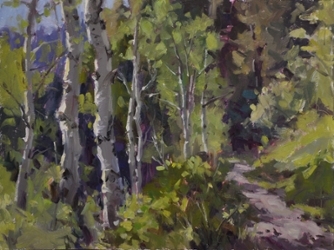 Her landscapes all begin as a plein air study, allowing her to capture the light in nature. She is always prepared to paint, as she never knows when nature is going to surprise her with a beautiful skyline, storm or sunset. For more information, visit Ellie Wilson's website.